Hanssen is leader and sole employee of the Kwando Carnivore Project. She shares the camp with Timmy and her husband Paul Funston, who leads lion and cheetah programs for big-cat conservation group Panthera. The camp is a cozy clump of tents and reed structures at the edge of the Kwando River on Mudumu Conservancy land in Namibia’s far eastern Zambezi region, within the vast Kavango Zambezi Transfrontier Conservation Area (KAZA). The family uses well water and a generator for power, and is linked to the broader world via satellite, cellphones, and a sandy, rutted road. 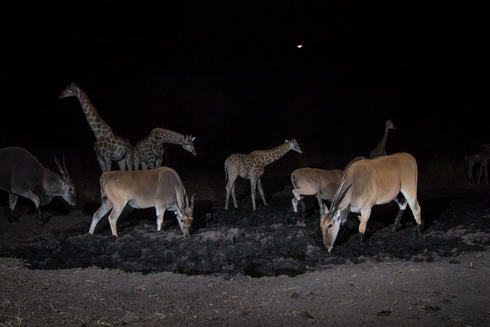 As part of a team effort to understand and protect wildlife in Namibia’s Zambezi region, we captured thousands of images, including (in the order pictured below): a female lion, giraffes and elands at a watering hole, a leopard, two elephants, a serval, a gathering of bush pigs, a racing hyena, and a porcupine. That data, in the context of human land uses in the area—settlements, farming, livestock grazing, harvesting of wild plants and animals—led to her current mission: to document and conserve the diversity of Zambezi wildlife and to find ways for people and wildlife to live together harmoniously. Today, Hanssen works with community game guards and government conservation managers—with support from Panthera, WWF, the Namibian organization Integrated Rural Development and Nature Conservation (IRDNC), and others—to document the area’s wildlife and mitigate human-wildlife conflict, primarily the predation of livestock by big carnivores. Hanssen’s particular role? 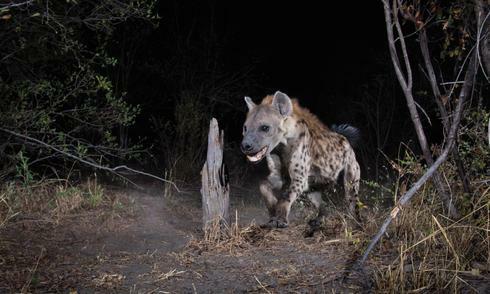 An ongoing research project to document the predators in a large but little-studied area of forest, Bwabwata National Park, and several conservancies that connect to wildlife areas in Angola and Zambia. 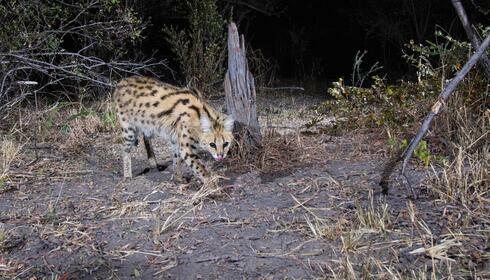 To collect the new data, Hanssen and her research partners mounted almost 180 camera traps to trees, positioned on opposite sides of roads or tracks within the forest, in a grid of 1.5-square-mile areas covering about 775 square miles. 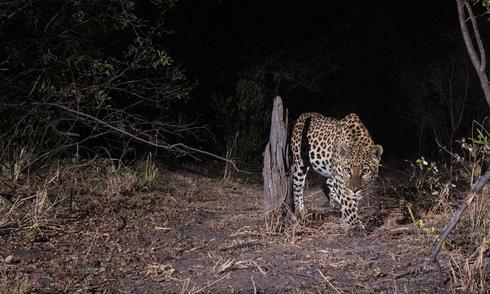 “Camera trap images are a preferred method for developing a baseline population survey of large carnivores,” Hanssen explains, “because the cameras don’t interfere with the animals, which can carry on doing their natural day-to-day activities.” For a two-month period, each camera recorded every animal that tripped its sensors, and sent the GPS-tagged image files to the satellite dish at Hanssen’s camp. Hanssen’s goal is to repeat the full survey every two to three years, and to train more community guards and local nonprofits like IRDNC to do the job and make more informed decisions about managing the conservancy’s wildlife. As a research tool, these images provided the first baseline numbers for leopard populations, information for the long-term monitoring of spotted hyenas, and insight into the pride structure of the lions on Mudumu Conservancy and in Mudumu National Park. As an unexpected but important bonus, the photos also documented how people are using the land, whether for grazing, foraging, farming, hunting, or even poaching. 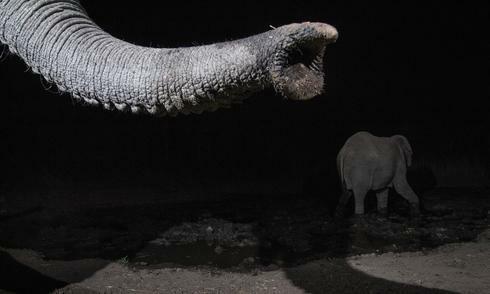 But what Hanssen hadn’t captured—yet—were the sort of eye-opening images that would grab the public’s imagination and make them care about the Zambezi region and the whole of KAZA. And that public engagement is so important: The state forest complex where Hanssen’s study is centered is protected in name only. It is also square in the sights of a proposed 25,000-acre tobacco plantation. So without public support for a more defined conservation status, a huge swath of the forest could soon be stripped to sow a single crop. Not surprisingly, her sense of urgency is palpable. Hanssen is always racing: racing to set camera traps or collect, catalog, and analyze the images; racing, with Funston, to train game guards to improve the lion-proofing of their community’s livestock corrals; racing to respond when a wildlife tracker calls to say he’s identified a previously unknown African wild dog den; racing, she says, to get persuasive data and influential images into the hands of the government, tribal authorities, and others who can direct the fate of this land. That’s where WWF and photographer Will Burrard-Lucas came in. Burrard-Lucas has made his name not only for photographing wildlife, but also for how he gets the photos. The inventor of the BeetleCam and other remote-controlled camera mounts, he’s become known for finding nonintrusive ways to get surprisingly up-close images of elusive wildlife. 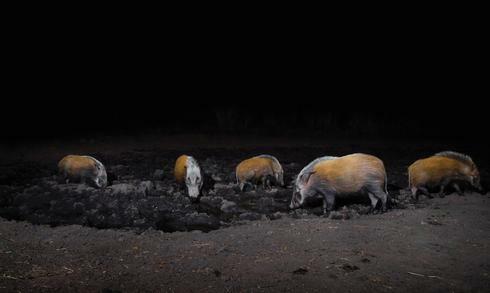 In July 2015, Hanssen and Burrard-Lucas teamed up to capture images that would not only supplement Hanssen’s ongoing work, but also amaze people and inspire them to get behind much-needed conservation actions. 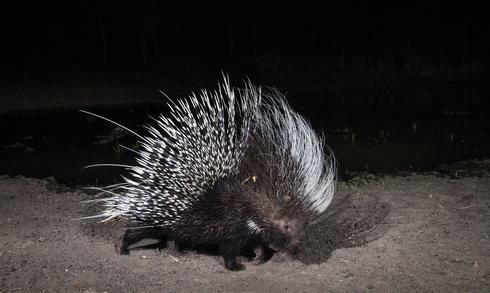 And since the Zambezi’s predators are primarily nocturnal, the best images were captured at night. 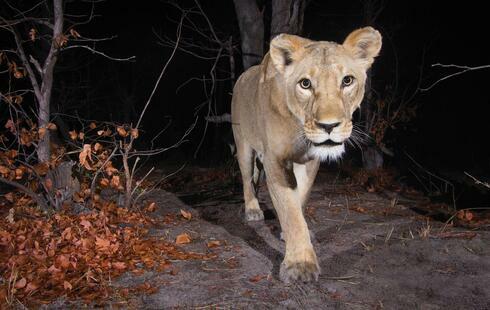 Learn more about Will Burrard-Lucas' work with camera traps.